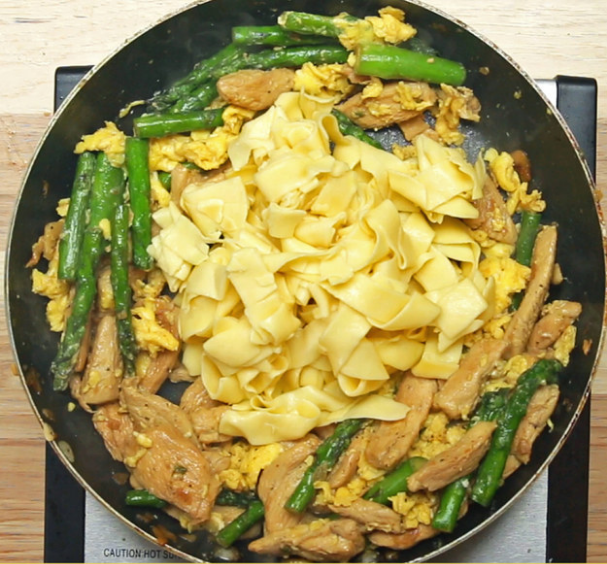 If you ever have the desire for a quick weeknight meal, this chicken and egg stir fry is the perfect way to go. Heat the oil in a pan over high heat. Cook the chicken with salt and pepper, browning the sides. Add garlic, then cook until garlic starts becoming translucent. Add asparagus and cook for two to three minutes. Add the soy sauce, stirring evenly until the chicken is evenly stained. Create a well in the center of the pan by pushing the chicken and asparagus up towards the sides of the pan. Add the beaten egg in the middle, stirring until egg is cooked. Toss in the noodles until evenly coated, then serve!